Attach:phidgets.jpg Δ Phidgets are easy to program hardware - sensors, switches, actuators - sold by Phidgets Inc. This guide points you to what you need to get started programming Phidgets in C#/WPF on Windows. Phidgets software for Windows. Phidget Inc. page describing what to download and how to get started. Includes drivers for 32-bit and 64-bit Windows machines, and the control panel/server needed to run (and observe the state of) phidgets. All software will be installed in C:\\Program Files\\Phidgets. After installation, you may lso see a 'Ph' icon in your task bar, which means that it has actually started the Phidgets Server. Selecting that will raise the Phidgets Control Panel (more on that later). You will also have a Phidgets menj item (contaiing Phidgets Control Panel added to your start menu - you can select that to start the Phidget Server/control panel if its not already started. In the General tab, check the 'Start Phidget Control Panel with Windows' box at the bottom left. This starts the Phidgets server. Plug in any Phidget (i.e. attach it to your computer with a USB cable). You should see it appear in the General list, where it shows its Device name, a unique serial number, and a version number (see image below). You can plug in as many phidgets as you like. Double click the phidget in the list. Another control panel will appear, that gives you the status of that phidget and (if that phidget allows it) ways to control it. For example, the figure below shows the control panel (left) where it shows that it sees the Phidget Servo Controller attached to this computer, and where I had selected that. 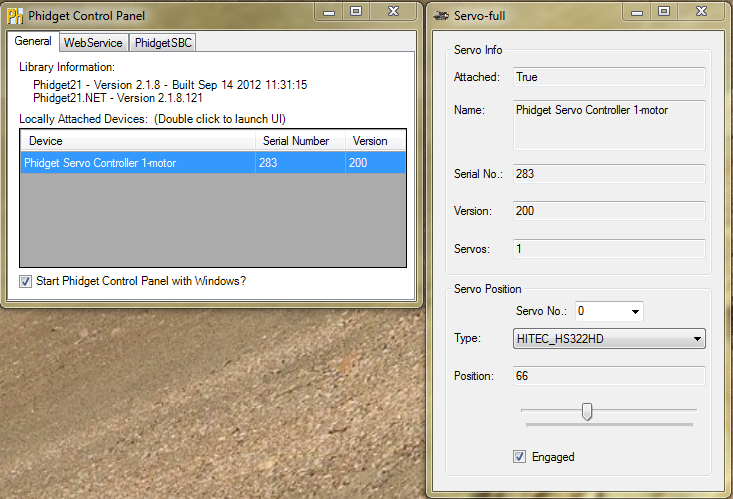 The right panel shows the status of that servo, and includes a slider that allows me to set the servo motor position. Other phidgets will have panels that are unique to their capabilities. Getting Started User Guides to particular Phidgets is a Getting Started guide for your Phidget. It typically lists all the parts you will need (to make sure its complete), what its particular control panel will show (via the Phidgets Control Panel), and technical details (which you usually can just skim over). Primer on the various phidget devices. Contains primers on particular products controlled by a phidget, such as the electronic nature, capabilities and workings of a particular sensor, motor, LED, etc. You probably don't need to look at these in any detail, but it may help if you skim it to see how your particular product works in general. C# programming in Phidgets explains and gives examples of how you can control Phidgets from C. You will want to look at the Windows (2000/XP/Vista/7) section. Simple Servo. Program a servo motor. Illustrates basic steps such as adding references, event handlers, etc. InterfaceKit. Program sensors, switches and low-powered outputs. Builds on the previous example. Note that you should put a switch on input 0, an LED on output 0, and some kind of sensor on sensor 0 (e.g., a slider or light sensor). RFID Reader. Shows how you can turn its antenna on, get RFID tag values, and operate its LED. Zip file of simple Phidget Programs in C# provided at the Phidgets, Inc. web site. Original Phidgets paper] describing the Phidgets concept and its early form. Greenberg, S. and Fitchett, C. (2001) Phidgets: Easy Development of Physical Interfaces through Physical Widgets. In Proceedings of the 14th Annual ACM Symposium on User Interface Software and Technology - ACM UIST'01. (Orlando, Florida), ACM Press, pages 209-218, November 11-14.